Those are the last six words of the very last episode of Crazy Ex-Girlfriend. It’s a line that the creators of the show had known they were going to do from the very beginning — even as things changed, even as plots shifted and actors left, the ending of the show stayed the same. Because the show was never about who Rebecca chose. The show was about Rebecca herself and her quest for happiness — and the fact that, in order to find happiness, she needed to find herself. Oh and it had musical numbers. So many musical numbers. When I started watching the show, I quickly knew I was seeing something special. There are those rare shows that don’t just hook you, but they pull you in and tell you, “Sit down and watch this show every week and also watch the videos and also look up articles and also talk to people on forums about it.” The shows that mean something to people. Crazy Ex-Girlfriend meant something. It combined a genre I didn’t like (romantic comedies) with a genre I was pretty indifferent about (musicals) and created a dark fucked up comedy about obsession, depression, mental illness, and creativity. 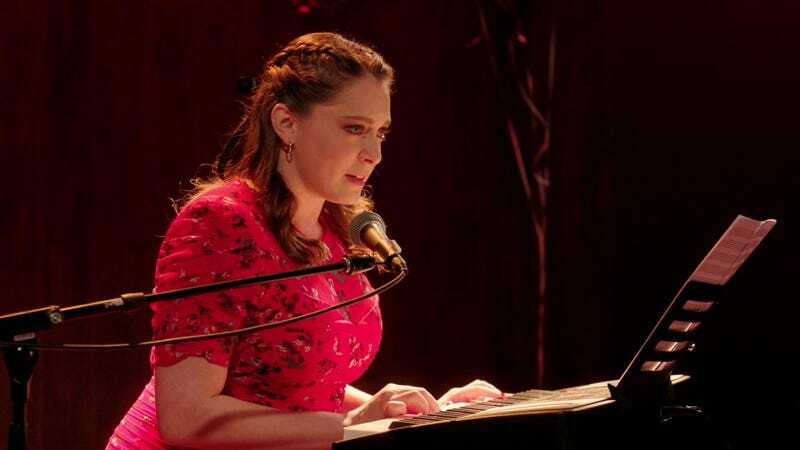 After Rebecca backslides in Season 4, she sings a song called “The Darkness,” all about the personification of her own depression and anxiety. It is possibly the perfection encapsulation of the show itself: a true and frank look at how this character feels, how she lived with this inside of her, and how she is trying to move on. Also, she names the darkness “Tyler” and mentions that he’s a drummer, because of course he is. Because the show is dark and serious and also silly and hilarious. Because it can show you a bossa nova number about people projecting their issues on you, before switching over to the main character trying to commit suicide. Oh yes. There are very, very few shows or movies that can make me cry. In fact, before Crazy Ex-Girlfriend, the list of shows was one: the Buffy the Vampire Slayer episode “The Body.” And now I have to add Crazy Ex-Girlfriend to that list, because dear god, it made me cry. But the episode didn’t end on her suicide attempt. It ended with her asking for help. The show is never bleak or depressing in itself. It never takes the view that nothing can get better. Things can get better. With therapy, with friends, with medication. The end of the fourth season ran back to the romantic comedy well by having Rebecca need to choose between three men. Three men who, over the course of the show, had all developed into viable love interests — they had themselves done the work of becoming better people. But, well, the show isn’t about them. It was about Rebecca. And no matter who Rebecca chose, it wouldn’t have made her happy. How could she be happy without knowing who she is? And so we get the final twist: she doesn’t choose anyone. It’s not that she doesn’t want to, but she can’t. Not until she figures out how to make the internal external; how to turn those songs she always imagined into a reality. How to tell her own story. “This is a song I wrote,” she says and smiles. This isn’t the end, not for her. Even as the screen turns black, Rebecca Bunch sings her song to friends, family, and strangers.